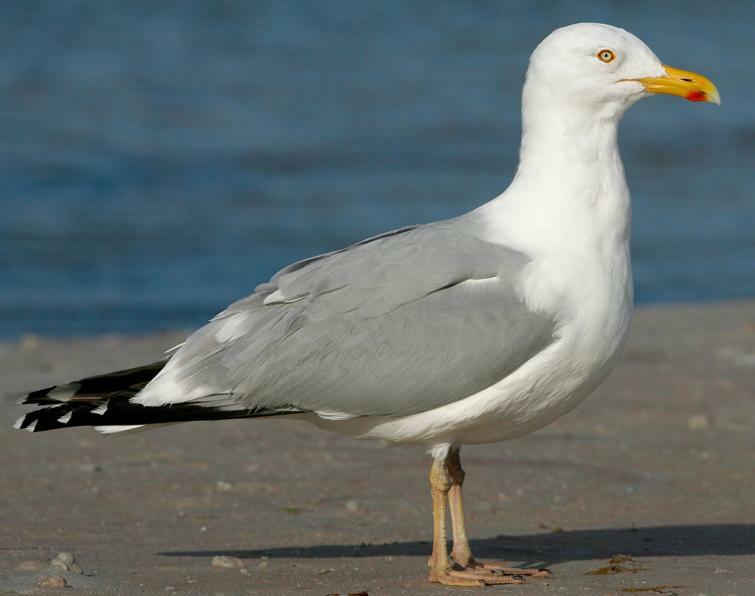 Larus argentatus Pontoppidan, 1763, Denmark. Four subspecies are recognized. 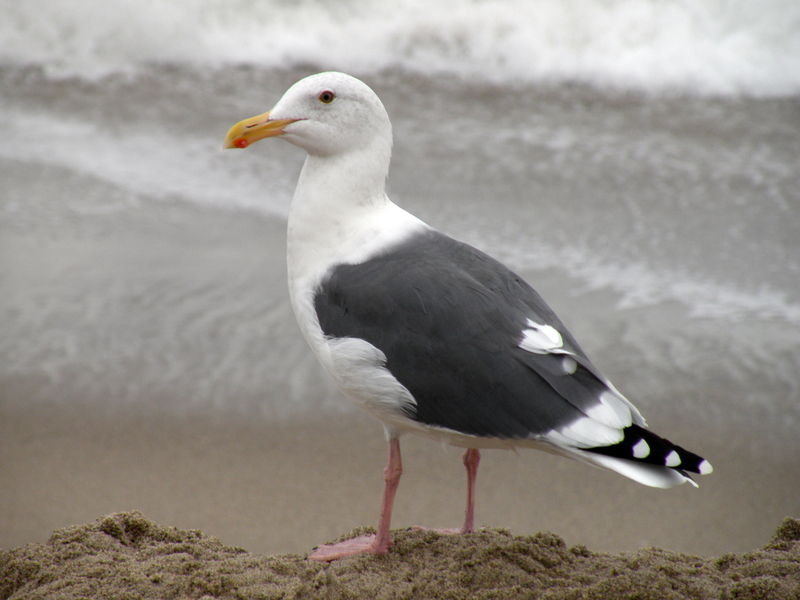 French: Goeland argente; German: Silbermцwe; Spanish: Gaviota Argйntea. 22–26 in (55–67 cm); 1.6–3.3 lb (720–1,500 g), depending upon location. 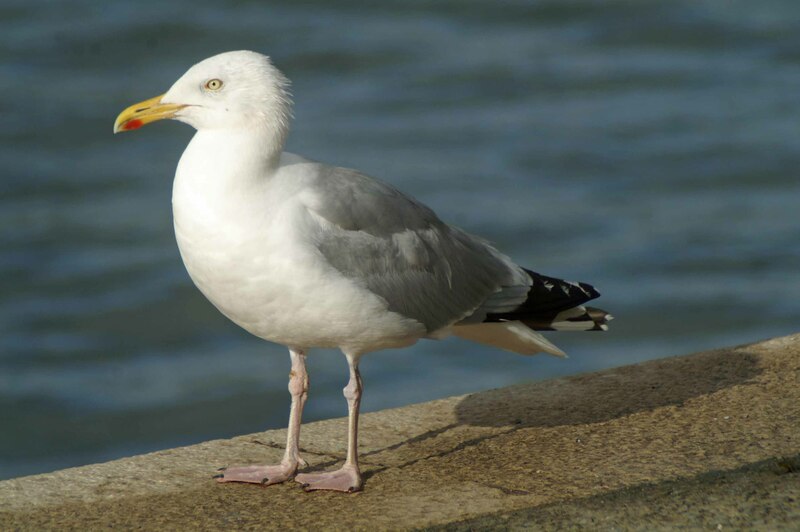 Large gull with heavy body and powerful bill; white head, underparts, and tail; gray upperwings and mantle; yellow bill with red gonydeal spot during breeding; pink legs and feet. Juvenile basically gray-brown with pale spots and blackish primaries and tail. Full adult plumage takes about four years to fill in. North America, Iceland, Faeroes, Britain to Germany and west to northeast Siberia and China. Breeds along coasts and near inland lakes and reservoirs. Wide diversity of breeding habitats, including rocky cliffs and ledges, grassy islands, sandy beaches and islands gravel bars, salt marshes, and rarely in trees and on buildings. 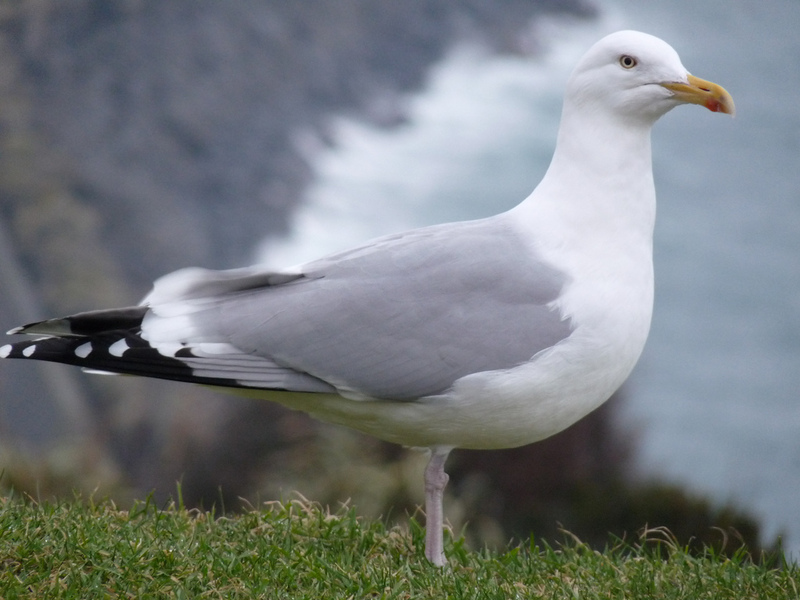 In non-breeding season, mainly coastal and near coasts. Also forages at garbage dumps. 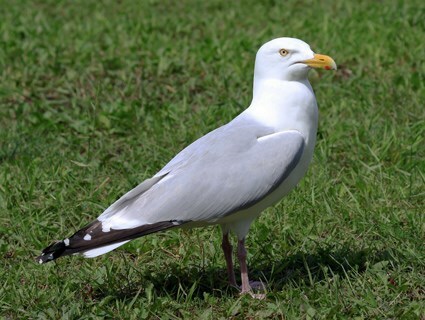 Diurnal, social, occurs mainly in flocks while foraging, and breeds in colonies (rarely solitarily), either with conspecifics or in mixed-species colonies. Mainly active in the early morning and late afternoon but can also forage at night. Very variable in feeding methods, feeding habitats, and prey items. Omnivorous and highly opportunistic; diet includes fish, earthworms, crabs, other marine invertebrates, berries, carrion, and garbage. Monogamous with long-term pair bonds, high nest-site fidelity. Generally lays three eggs April to early June. Nest is vegetation generally placed on the ground or a cup on bare rock. Both sexes guard territory, build the nest, incubate the eggs, and care for chicks. Incubation period 28–30 days. Brooding 40–45 days. Post-fledging care of up to 45 days. First breeding between three and seven years. Not threatened. Increased markedly in mid-1900s due to exposed garbage dumps and offal from fishing, decreasing in some places with the closing of landfills. Declines in the Great Lakes due to pollutants. Eggs eaten in some places; meat seldom eaten. Feathers collected in the late 1800s for the millinery trade. Serves a useful scavenger role.